How to get social without social media? / How to get social without social media (and achieve blogging success)? 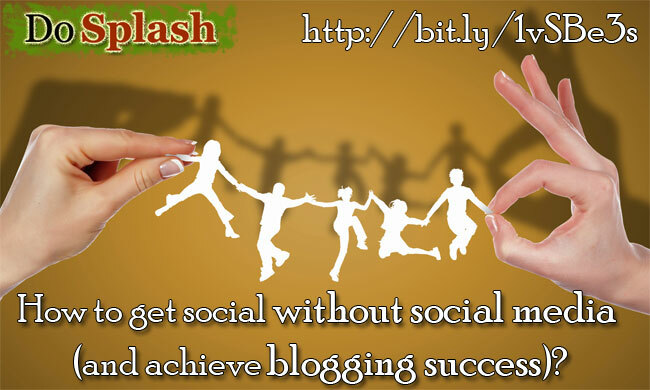 Getting social is a crucial aspect if you are doing business online. Why? Because getting social means connecting with real people. Rather than bombarding people with a variety of marketing techniques, getting social is a more informal and smooth way to get attention. And by becoming a social animal you (your business) connect with real people. Making friends is part of the game and doing it in a genuine manner (without expecting returns) is the way to go. Why is it so important to genuinely connect with people? It is because real, living people are the ones who do business with you. They are the ones who will buy your products, they are the ones who will avail your services – in short, real people are the ones upon whom you should base your business. You have to develop a business that will solve the problems of people or that will vent their desires. Your business should make their life easy, or exciting, or less painful or something like that. Your business should care for people and their pain points. All in all – real people should be involved and they should be the base of your business. Survey about their most pressing problems/pain points etc. Now that we have established the importance of socializing let’s get to the “how to” of it. Whenever we talk about socializing we think about social media, right? Well social media platforms like Facebook, Google+, Twitter, Pinterest and the like are great places to socialise – to hang out with friends, to market your business, to make contacts and much more. But social media could be a GREAT distraction. If your marketing strategy involves social media (it should!) then you certainly know what I am talking about. You login to Facebook to promote a post of yours and then end up doing the infinite scrolling. You login to YouTube to comment on your favourite channel and then end up watching countless cute cat videos. You login to Twitter to participate in one of the community chats and then end up scrolling through the tweets, checking the links, and watching videos. I can go on and on, but you probably got my point already. While I am going to talk about getting social “without” social media, I am NOT against social media in any way. In fact, social media should be part of your blog marketing strategy. However, socialising or connecting with people is not limited to social media. That is my point. Let’s see what options we have got in this direction. Blogging communities are places where like-minded folks hang out. And that is a perfect place for getting social, right? Socializing with like-minded folks makes it really “social”. People join the community, create a username and password, and then they login and submit links ONLY to their own blog posts. And then they leave the community and never come back until they have another blog post of their own to submit to the community. While blogging communities are great platforms to help you socialize, it is your responsibility to make the most out of it. As I said, if you do not take responsibility to make the most out of blogging communities, your time there will be wasted. However if you DO engage and involve, you can get great benefits. You can make new connections, gain traffic and you can expand your network which can in turn take your blog to the next level! You should also check out this post: Why small business owners should join blogging communities? Well I’m a fan of blog commenting. It has helped me with taking my business to the next level. A lot of contacts I have made today are made via blog commenting. I can showcase my expertise and be useful to people. At the same time I can build my authority in the blogosphere. It works great for socialising. Now the last point is the focus of this post. Through blog commenting I not only connect with the blogger but also with his/her community. Sometimes I leave a comment on the post as a conversation with the author. Sometimes I reach out to the community – if I find a comment useful and insightful, I leave a reply to the comment and initiate the conversation. This helps me to establish connection with the commenter. However, in order for blog commenting to work effectively, you have to make sure you don’t leave comments for the sake of it. Or for the sake of stalking people to get their attention and eventually establish connection with them – this is a BIG NO! Especially when you reply to commenters, don’t try to hijack the topic or be rude, if you have to disagree with them. Being polite, staying in context and being useful and friendly DO matter a lot! If you strategically do blog commenting for a consistent period of time, you can get GREAT benefits with blog commenting. Just like blog commenting, guest blogging is an effective way to socialise with your target audience. Now, this may sound strange to you. I actually didn’t believe this concept (that I realised myself – no one taught me) until I realised what results I got with guest blogging. Bloggers usually do guest bloggers to gain traffic and build authority. I personally found that, apart from the traffic I got, I was able to establish many new and genuine connections over the time. Those connections were purely genuine, helpful and helped take my blog to the next level. Without doing guest blogging I wouldn’t have been able to establish those connections. Again, just like blog commenting, you have to adopt a strategic approach to guest blogging as well. You should not focus on building links and just start blasting guest blogging all over the web. Your guest blog should not be a mediocre blog post or “just another – 5 ways to do *something*” post. You should publish your extraordinary and your best content on other blogs as guest post. I know it is tempting to publish great content on your blog. But you have to hold on – you should rather publish that post on a blog that is larger than yours (in terms of audience and reach) and a blog that have a stronger authority than yours. This way you can reach more audience with your outstanding content and it will be easier this way to establish your authority. And do I have to say that you can reach and connect with more people when you land your guest post on a high authority blog? Connecting with more people = more options to socialize. There you have it! 3 ways via which you can socialise with people in your industry (and even outside of your niche). Now, social media is great for socialising; but it is not the only option! For those of you who find social media to be a distraction, or if you prefer to have more ways to socialize, or if you’re not comfortable with social media, these 3 ways would suit you much better. Do you know/use any other ways to socialise with your readers, customers, peers and friends online? Do share in the comments! Thanks for sharing this. I got to agree about knowing the hot topic part. In most cases, many of us don’t really find the topics which is actually attracting traffic. THere isn’t any use of ranking #1 when no one is searching for the information / post. So yes! You nailed it and thanks for sharing! Hmmm… I don’t get it Reginald! May be you left this comment for a different post? Well said Julie 🙂 One has to stand out in order to be recognized and even to be connected. Coz there’s so much information out there and so many people!